On September 27, 1975, the Vols defeated Auburn 21-17 behind Larry Seivers 2TDS and Stanley Morgan’s 138 yrds rushing. On November 22, 1975, Stanley Morgan had 17 carries for 138 yrds and an 80 yrd TD in a 17-13 victory over Kentucky. Eric Gray set the record for TDs as a High Schooler in Tn at 138. 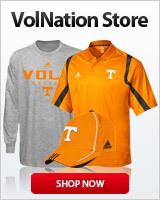 EG, if you are out there looking at Volnation.com make yourself know. We would enjoy your input. If you aren’t, it’s probably for the best. There are some real hackwagons that just don’t get it, go work out or study film. You are NFL quality. Thanks for being a VFL. We needed the help. On October 15, 1983, Clyde Duncan had 137 yrds receiving and 2TDS (80 yrds and 57 yrds) in a 41-34 win over Alabama. On November 28, 1998, Travis Henry rushed for 136 yrds and 1TD in a 41-0 victory over Vandy. On November 19, 1988, Alvin Harper caught 6 of Jeff Francis’ passes for 135 yrds and 2TDS in the Vols 28-24 victory over Kentucky. In Los Angeles on September 9, 1989, freshman Chuck Webb had 22 carries for 134 yrds and 2TDS in a 24-6 victory over UCLA. In 2013 in the win over Kentucky Rajion Neal rushed for 134. Should I be worried, given that this thread has yet to be updated today? On November 6, 1965, Charlie Fulton had 133 yrds rushing in Tennessee’s 21-7 victory over #7 Georgia Tech. In 1967, “The Swamp Rat” Dewey Warren completed 78 of his 132 passes for 1035 yrds and 6TDs. On October 2, 1976, Larry Seivers tied a Vols record with 11 receptions for 131 yrds and a TD in a 21-19 victory over Clemson. On January 1, 1951, Hank Lauricella had 16 carries for 131 yrds which included a 75 yrd gallop that set up the Vols first score. Hank also had 23 yrds passing and 18 receiving yrds in the 20-14 victory! Daryl Dickey threw for 131 against Miami in the Sugar Bowl back in 1986. In 1992, Heath Shuler attempted 224 passes with 130 completions for 1712 yrds and 10 TDs. I wish I could like this more than once. What a game! What an incredible weekend! Thirsty Tennessee fans returned to New Orleans and the Sugar Bowl for the first time since 1971. We were legion! We were such good guests that the entire city mourned our departure and urgently wished for our return. We did come back five years later and further cemented our reputation as spirited, congenial, and generous fans. We are long overdue for another visit.